Sometimes when the light is not exactly right for wide-angle landscapes, it is fun to crawl into slimy dark places at low tide. You just never know what you will find! No HDR. Have a look at this month's American Photography Magazine. I have a bunch of pictures in there in different places! Free wallpaper for over 100 of my images in 6 different screen sizes is now available! See the 1200 pixel version! There is not a single 90 degree angle in this shot. 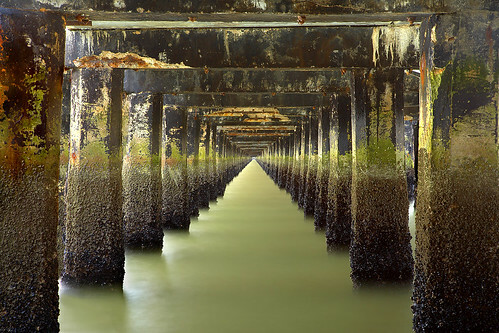 This view underneath the rather asymmetrical Berkeley pier was taken at low tide so that the mussels and dark seaweed can be seen. And only at low tide is there room to squeeze into this spot. Waves kept splashing salt spray onto the filters because I had to get right up to the edge of the water to exclude distracting elements. So it took about 20 minutes of trying before I got a good image. And I had to wait about 1 month for overall light and tidal conditions to be right. This was a soft, foggy day with light coming from the left. Sunny days are too harshly lit this sort of image to work very well. People were giving me strange looks as I squeezed between some pipes and other undefineable items, but this is the price you must pay! 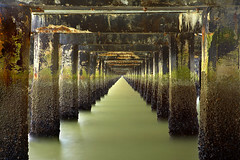 This pier points right towards Alkatraz Island in the San Francisco Bay. The map shows exactly where this is. See my profile for a link to my website where I have limited edition prints and less expensive open edition prints.